If you have kids, you are probably all too familiar with sibling rivalry and the different ways in which children express their hatred, jealousy, anxiety and aggression for their siblings. While it is normal for most families to go through a phase of mild-to-intense sibling rivalry, it can leave you – the unwilling referee – grasping at remnants of your sanity. So here’s sibling rivalry demystified, along with some pointers on how to cope with crazy sibling rivalry issues and strengthen the bond between your kids. 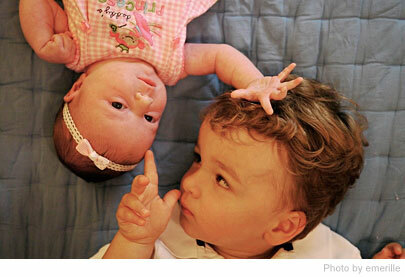 Why does Sibling Rivalry Occur? Boredom - This is one of the most common reasons why a child will bully, harass or fight with a sibling. Ignoring his behavior and doling out punishment is only going to exacerbate such behavior. After all, to a bored child, there’s no better way to have some fun than bug a sibling and get a reaction out of her. Tip - Here’s a useful strategy to counter boredom-related sibling rivalry – get your kids involved in some new interesting activities that will get their minds off squabbling. Make sure the activity is fun and absorbing and don’t push it if they don’t seem interested. Individual Temperaments - Each of your kids has a unique personality - habits, moods, adaptability and disposition – that plays an important role in their interaction with each other. For instance, one child could be a quiet type with a great need for solitude, but another could be more gregarious and outgoing. This difference in individual temperaments could be a possible reason behind the sibling rivalry. Tip – You can prevent sibling rivalry by being generous with your love and attention with each child, regardless of the differences in temperament and personality. Kids that are confident of their parents’ unconditional love are less likely to fight with their siblings. Accumulated Issues and Resentment - This is what happens when parents fail to address squabbles among siblings to use unhelpful strategies to resolve them. The average parent does this by stepping in in an attempt to solve your kids’ problems by punishing one or both. Child rearing experts say this is the wrong way to tackle sibling rivalry because it only ends with the punished child harboring resentment toward the rest of the family. This resentment is acted upon when your child finds new underground methods to bug his sibling and drive the parents crazy. Tip – Your child may feel a lot of accumulated dislike, jealousy and resentment towards you and his siblings. Your approach should be a loving and respectful attempt to solve your kids’ problems rather than playing judge without understanding the issues or making a child feel unloved, unworthy or undervalued. How you deal with the issues that have developed between your children determines their attitude and future relationship with each other. Make sure you resolve their sibling rivalry in a mutually respectful manner.